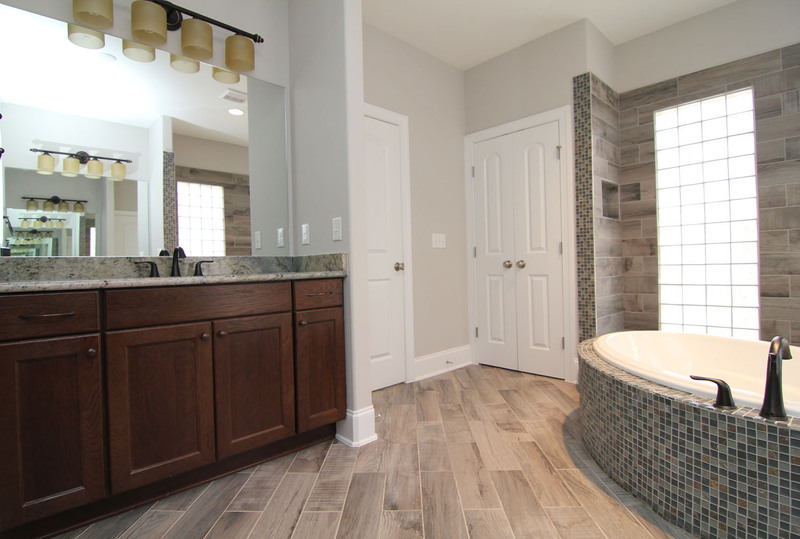 Ways to modify the master suite bathroom for the owner’s suite are some of the most common requests when building a custom home in North Carolina. (See several other common requests for floor plan modifications here). 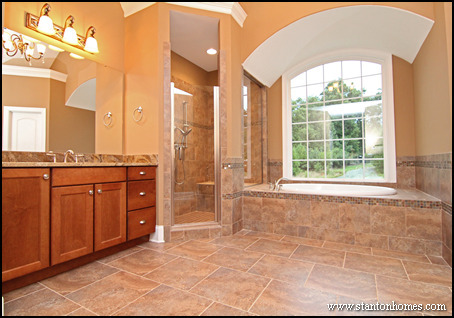 Below, find examples of how to design spaces for two - with photos, paint colors, cabinet wood types, and tile colors - inside your Raleigh new home. 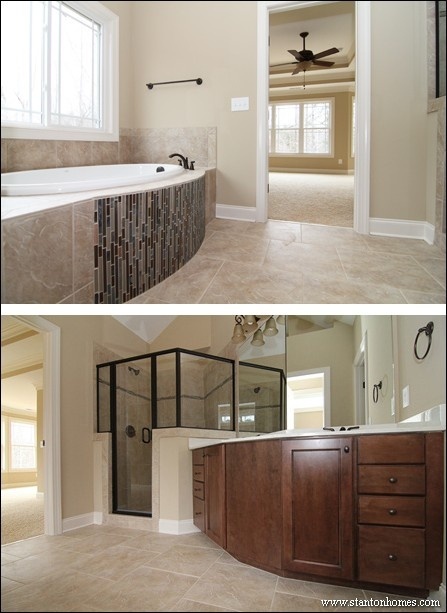 Here are 11 photos with descriptions of these custom home master baths designed with room for two. 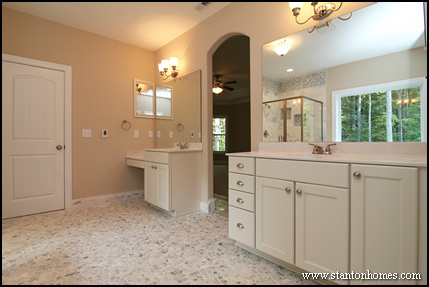 This master bath has dual vanities across the room from each other, to provide plenty of space to maneuver. 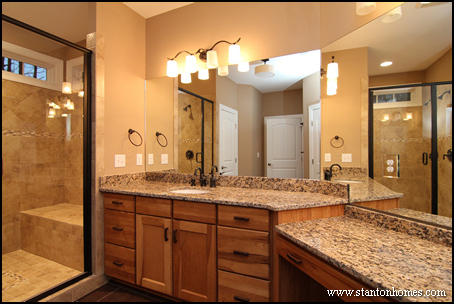 The dual vanities on opposite walls in this photo of a custom home master bathroom create complete separation with as much space for each individual as typical shared countertops. The shower is designed for two, as well, with two shower heads. 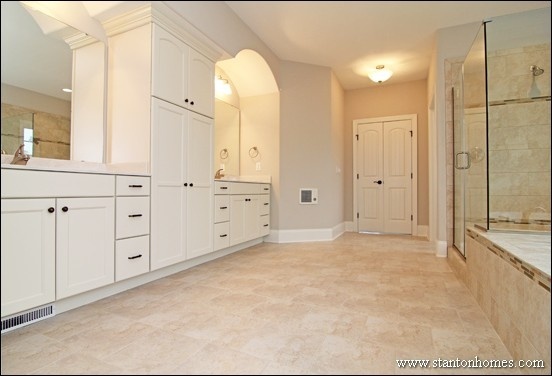 Tile and counter tops in this master bath are in Carolina Cream, Snow White, and Pearl. 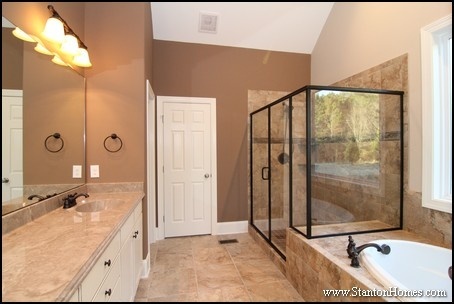 See more photos of this Raleigh custom home, here. 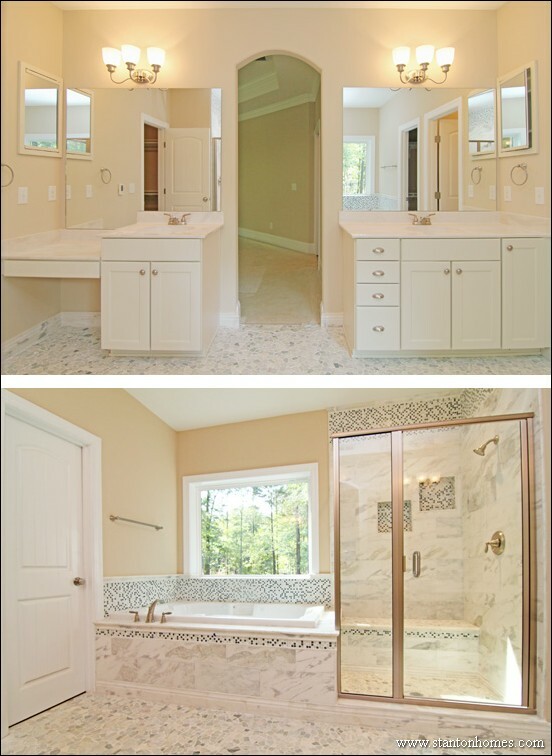 Design tip: Dual vanities that are separated can create flow for the room when used to frame a custom bathtub or shower. 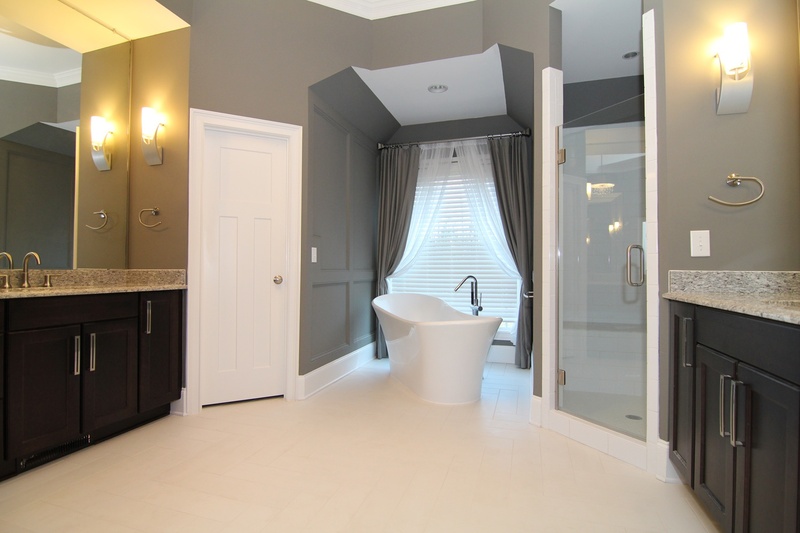 The sophisticated appeal of this bathroom is enhanced by colors and textures that compliment the master suite separated only by glass French Doors (see photos of the master suite fireplace and sitting room). 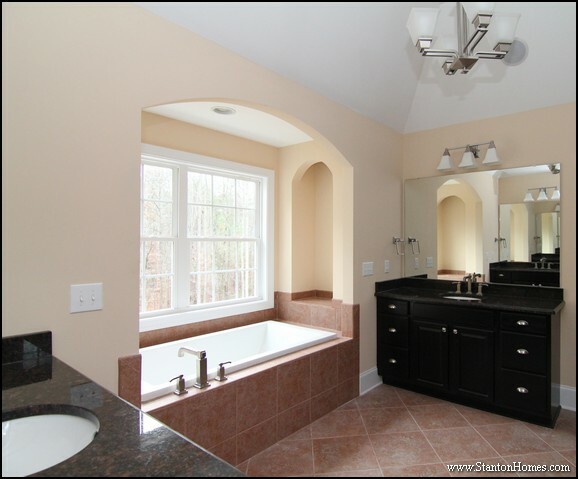 Touches of traditional design, such as the arched entry above the tub and 12x12 tile pattern, blend harmoniously with contemporary accents, including sleek, square vanity lights. See the full photo tour of this home, here. 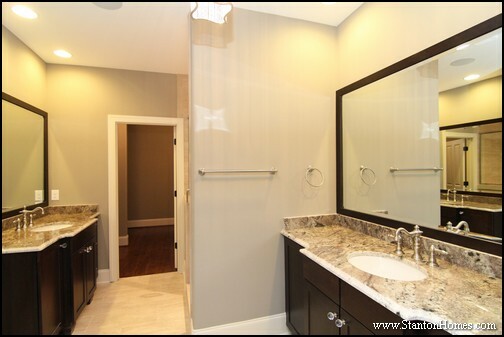 The photo of this Upscale Urban Craftsman master suite bath illustrates the appeal of Contemporary espresso, grey, white, and black tones - combined with soft crystal and pensive stainless steel features – in this custom designed bathroom created by Stanton Homes. Full height mirrors are accentuated by sidelights, with a huge chandelier overhead and huge picture window that light up the room. Design tip: Use the open shelving to stack fluffy towels and favorite collectibles. 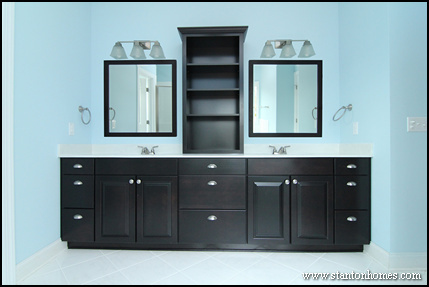 Master suite vanities can be built in varying heights. 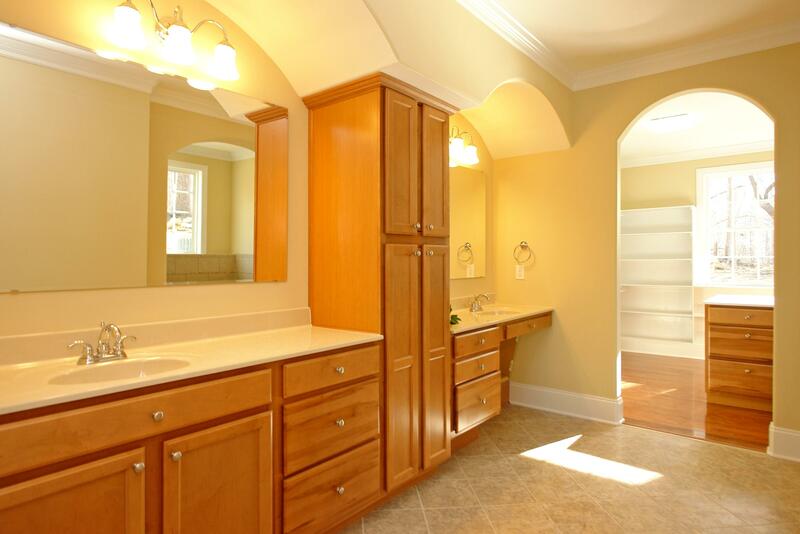 Generally, a 33 inch tall vanity is ideal for women, while a 36 inch tall vanity suits most men. A great way to vary heights without the room looking lopsided is to add a dressing table between vanities, as seen in this photo. The short vanity drawer is a handy place to store makeup and other items you want to reach quickly and easily. See the photo tour, here. Design Tip: In this master bath, a massive shower with separate shower heads replaces the tub – a frequent request in custom home building. 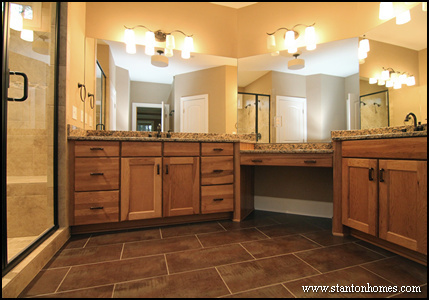 The dual vanity in this photo is aligned on the same wall – so you don’t see someone else in the mirror when you’re at your sink. It also has an integrated dressing table. While dressing tables are designed as a seating station, you can convert the under-counter space into a storage area. Just add a basket of towels! 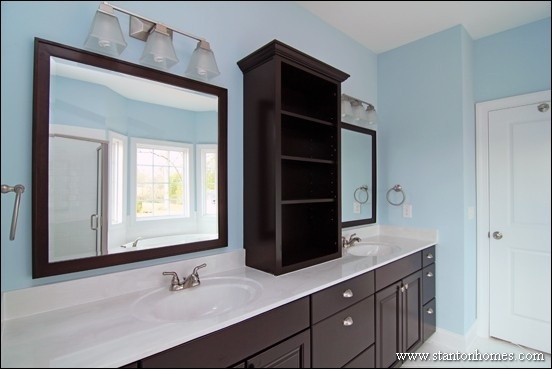 The vanity cabinets are a Maple wood, painted in Antique White. 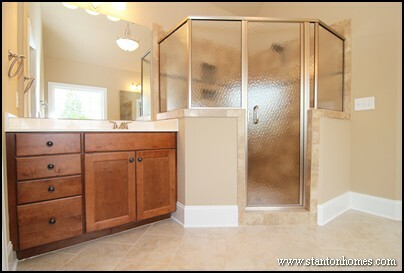 See more photos of this custom home master bathroom, here. 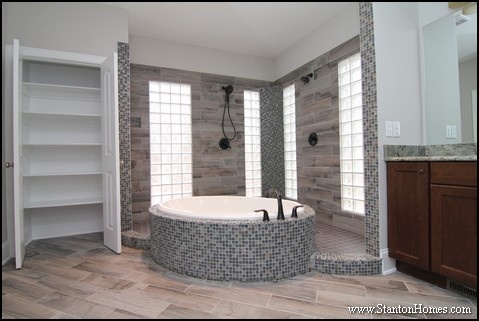 Design Tip: This master bathroom features several types of tile (floor-to-ceiling in the shower, extra chair rail style tile along the tub edges, and more). 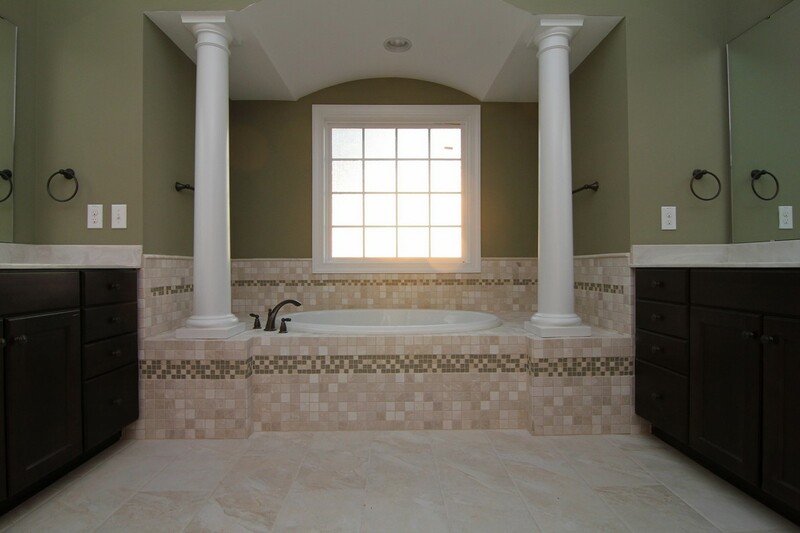 When working with Stanton Homes, our designers help you with selections throughout your home - including ways to integrate specialty tile patterns. 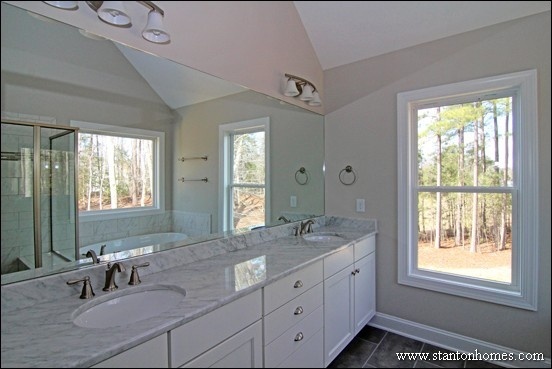 In this photo of a Raleigh custom home master bath, the symmetrical dual sinks are an under mount style designed for the granite counter top. 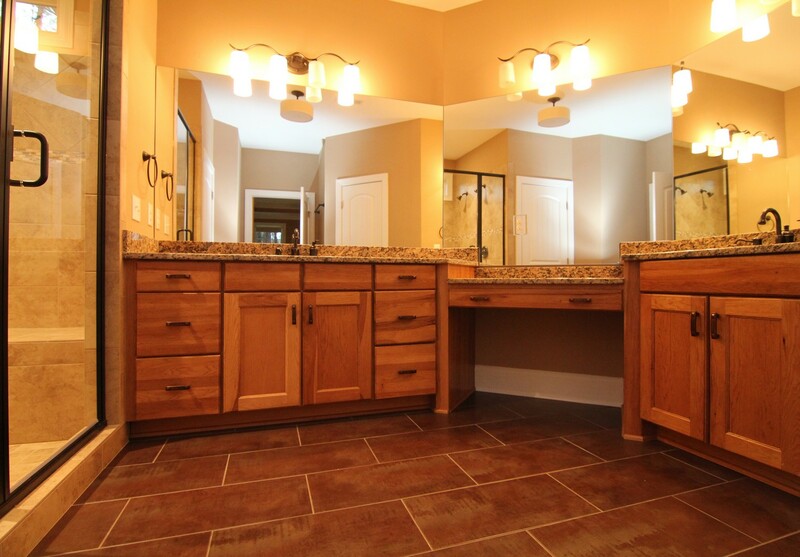 Dual vanity layouts like this require bathrooms with a long wall on one side. 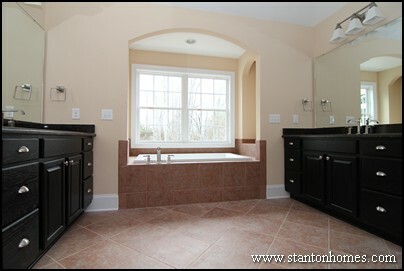 The soaking tub and a custom tile shower sit directly opposite to this dual vanity. Find more photos of this new home, here. 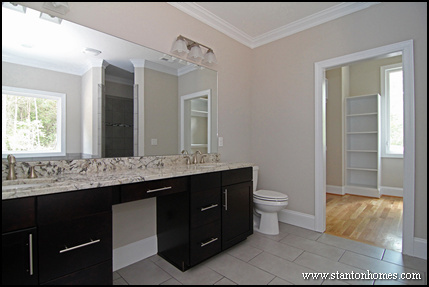 Design Tip: A center set of drawers - rather than dressing counter opening - can be very helpful for your storage needs. 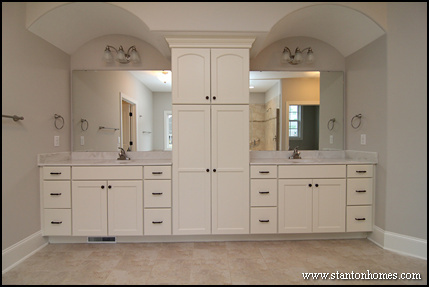 This photo of a double vanity in a custom master bathroom illustrates the impact of color. The soft blue hue of this room is designed to sooth, amid a layout that feels intimate and shared, with its close but separate grooming spaces. A bank of drawers and open shelving unit in the middle of the vanity defines personal space, while placing shared storage within easy reach. 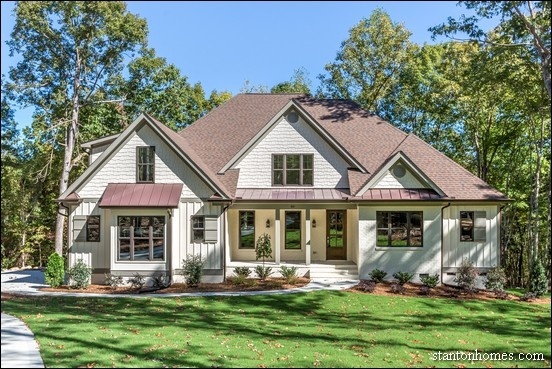 See inside this farmhouse style new home, here. Design Tip: Open storage will make your master bath feel more spacious. Open shelves like these are a great place to highlight glass apothecary jars filled with soaps or seashells. 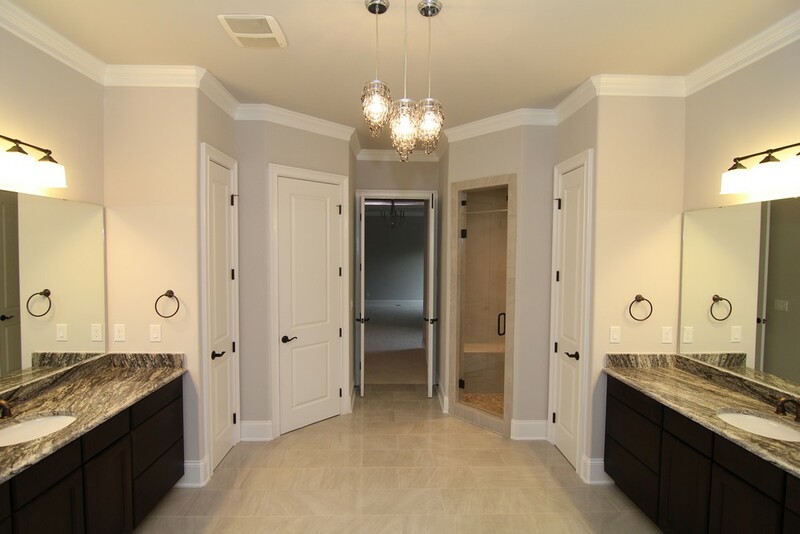 The elegance in this high end master suite bathroom is reminiscent of a spa retreat, with calming whites and cool grays. Furniture-inspired Antique White master bath vanities are tucked under barrel vault ceiling alcoves. 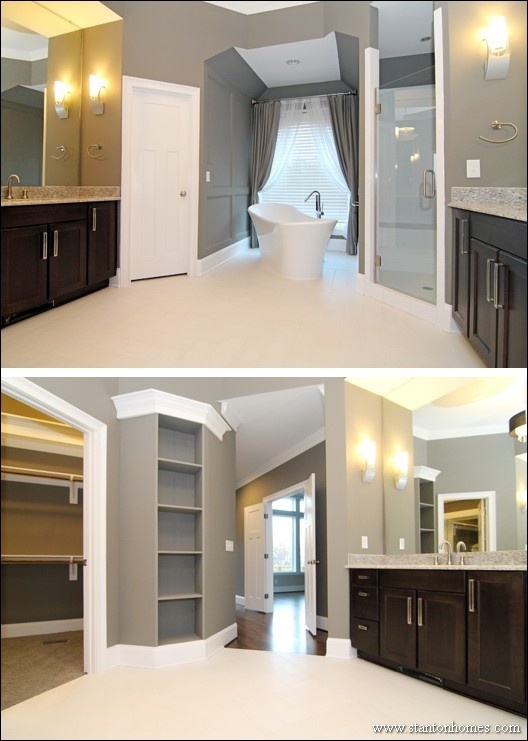 Floor-to-ceiling central storage tops off the sumptuous appeal of this amazing dual vanity. The counter tops are called Carolina Cream. The floor tiles are 13 x 13 Crema Pavia Antica. Design Tip: Ask your builder if they will work with you on creating custom ceiling heights. 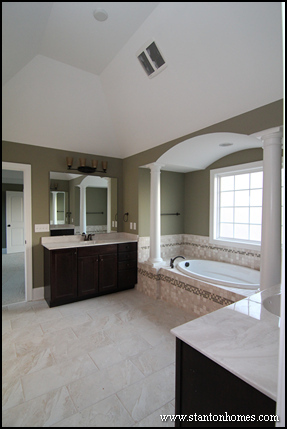 This master bathroom uses a special "drop ceiling" design above the vanities - making space for the barrel vaults and connecting the cabinets to create one smooth line in the center. 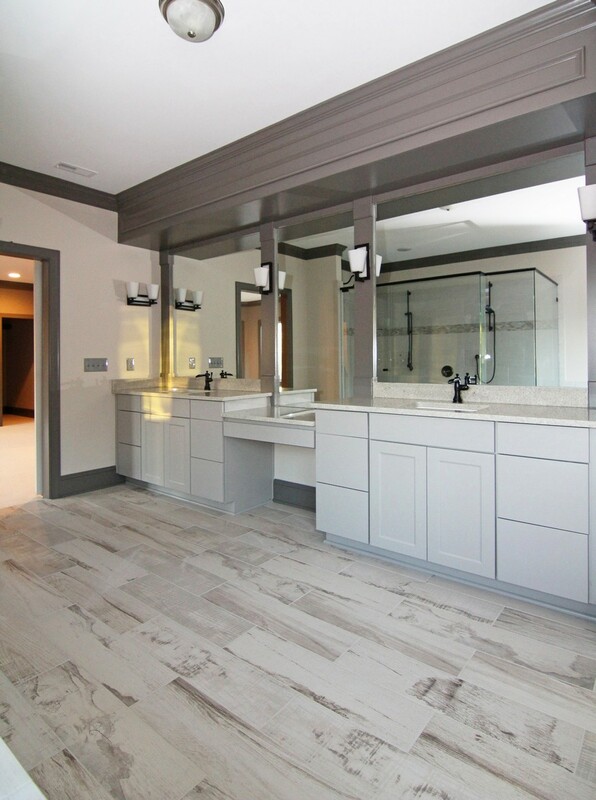 This photo of a master suite bathroom with dual vanities is filled with special spaces to share. In this custom home design, a three-way see-through fireplace is the highlight of the bathroom, at the entrance to the master suite. 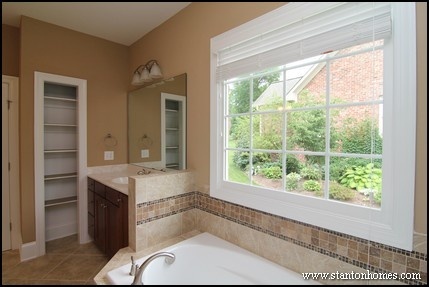 It can be seen from each vanity, as well as the soaking tub and shower. As flames flicker behind the glass around the fireplace, everything shimmers, from metallic tiles to bronze light fixtures, Smokey Topaz wall paint, and Golden granite counter tops with a 1/4 inch bevel edge. Click here for more photos (including the three sided fireplace). 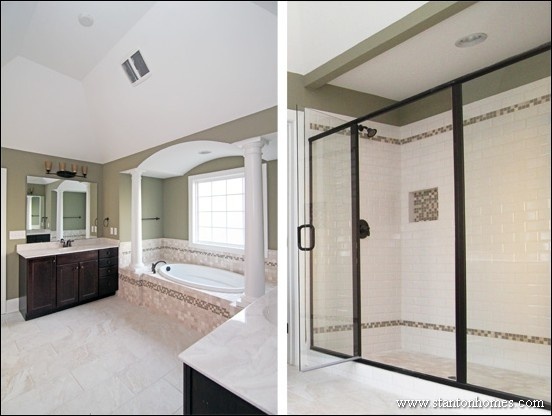 Design Tip: The spaces above the shower and water closet are designed as plant shelves. 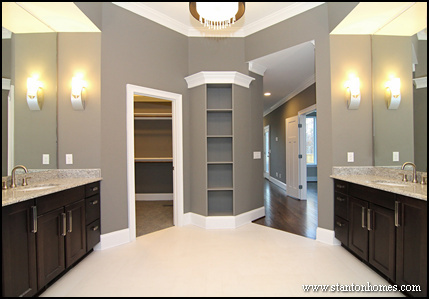 Ask your builder where you can integrate these types of built in decoration and storage spaces, throughout your home. 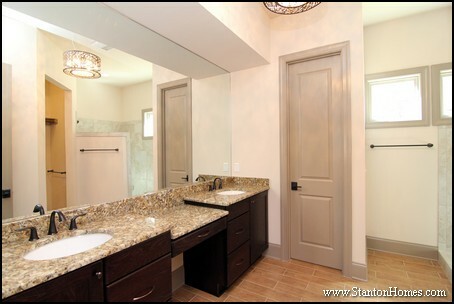 The photo of this master bath dual vanity illustrates how an angled vanity design can add creativity. It can also make good use of space. 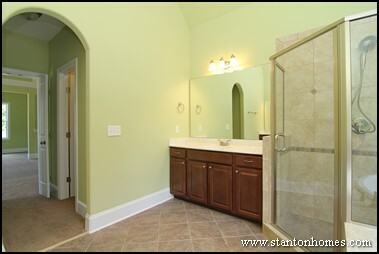 In this custom home, having a sitting room in the master bedroom was more important than having a sprawling bathroom. 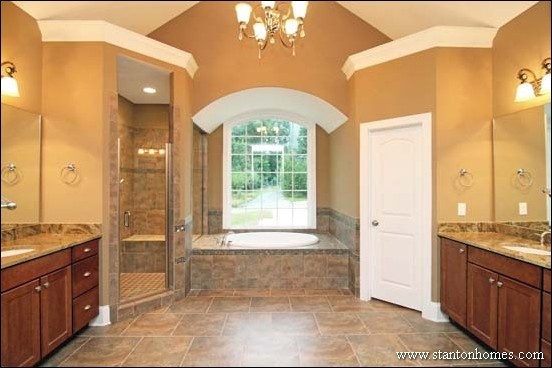 Yet there’s plenty of room in this master bath for an enlarged shower and custom soaking tub. 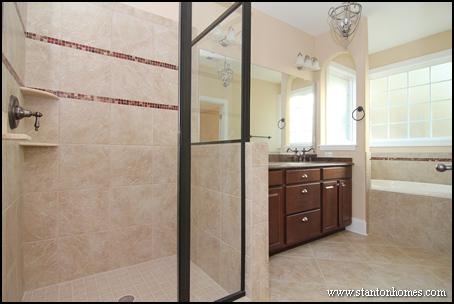 The black shower frame contrasts nicely against the medium brown cabinets. Get the floor plan and more photos here. 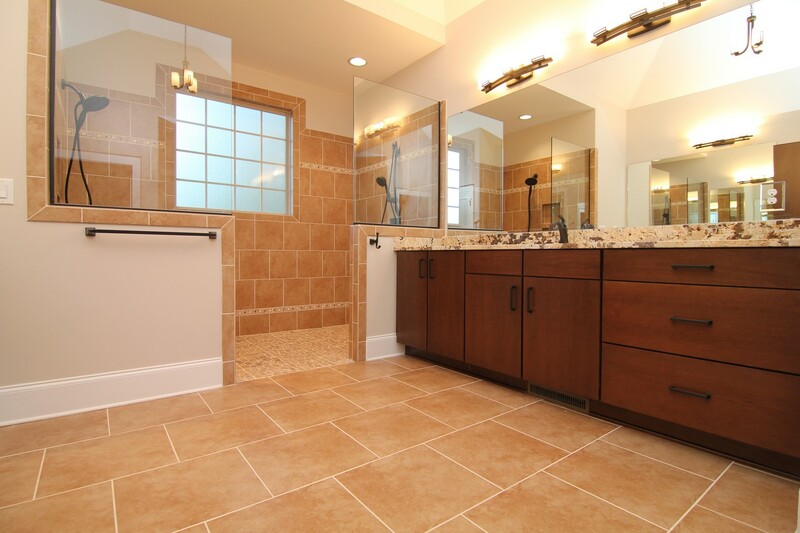 Design Tip: Re-arranging the master bath is a very common request for custom home builders. 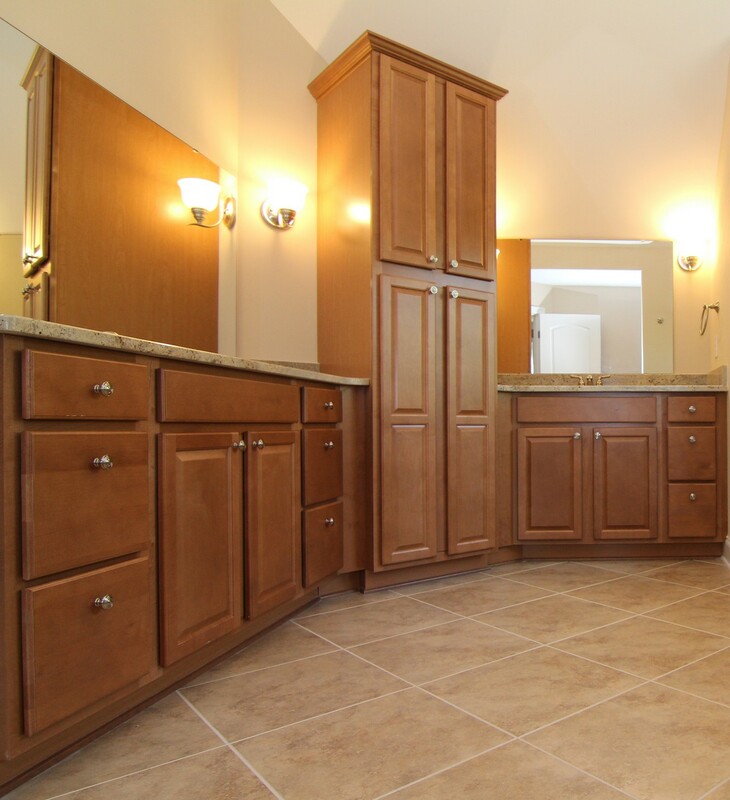 Tell us which of our floor plans you love, and we'll show you how to curve the tub deck, angle the vanity, and take advantage of all angles to maximize the usable space around your personality. 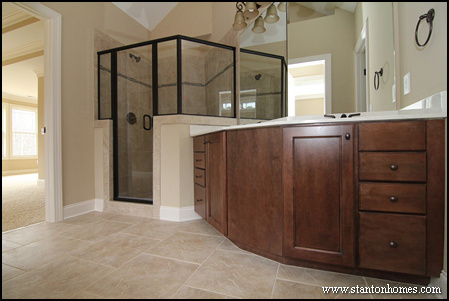 In this photo of a master suite bathroom in a custom home, the focus is on a huge shower with one vanity next to it and the other next to the soaking tub on the other side of the room. 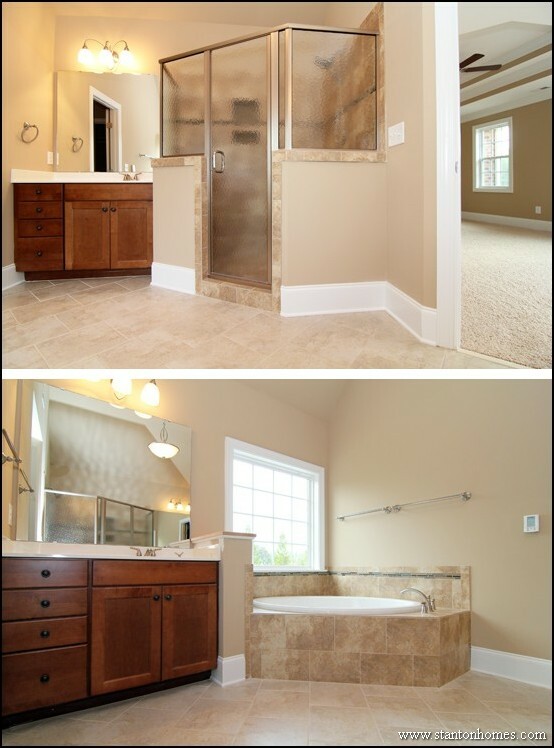 The bathroom is next to a private exercise room in this floor plan, so this layout was chosen so that this entire area of the bathroom would be used most often by one person coming straight in from working out, and the other entire area of the bathroom with its own tub and vanity would be used by the other. In addition to the vanities each having its own drawers, there is also an island cabinet in the master closet. See photos here.